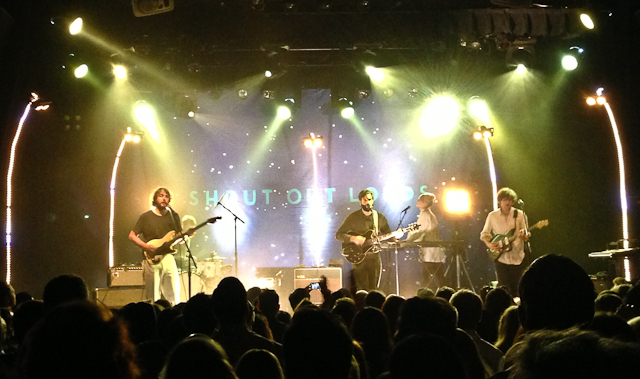 Stockholm’s Shout Out Louds have just finished their US tour in support of the new album Optica with a two-night stand at LA’s El Rey Theater. It was their first visit to the city in three years. If you haven’t heard them before, their music can be described as often bleakly wistful lyrics completely camouflaged by bright, sunny tunes. Over the years, they’ve increasingly polished up their production and slowed down their tempos — originally, they could clearly be categorized as garage-rock revivalists, but now they almost sound like Gran Turismo-era Cardigans in those regards. Drummer Eric Edman was not present for this tour. About The Sound Of Indie: TSOI is a few rabid music fans posting stuff from their collection for the world to hear. If you are in a band and want anything removed, please e-mail us.